As Congress reconvened after a 10-day recess, members of both chambers received calls from Catholics around the country Feb. 26 urging them to find a legislative solution to save the Deferred Action for Childhood Arrivals program, known as DACA. On the heels of the “National Catholic Call-In Day to Protect Dreamers,” hundreds of Catholic leaders declared Feb. 27 as a “Catholic Day of Action” in Washington. They planned a news conference, followed by praying and singing by some in the group inside the Russell Senate Office Building on Capitol Hill. “Given our heritage as an immigrant community, I urge the faithful across the archdiocese to stand together in solidarity with our Dreamers and to join the U.S. Conference of Catholic Bishops for a National Call-in Day for Dreamers,” Chicago Cardinal Blase Cupich said in a statement in advance of the national effort. Congress must protect “our young immigrant neighbors who want nothing more than to continue to contribute to the nation they call home,” he said. He called his own senators and representatives mid-day of the call-in event. The same day as the call-in took place, the U.S. Supreme Court declined to hear and rule on whether the administration has the right to shut down DACA. In September, President Donald Trump announced his administration was ending the program, giving lawmakers until March 5 to find a legislative solution to protect the young adults benefiting from DACA. Two federal judges blocked the Trump administration’s efforts to end the program, ruling the government must continue to accept renewal applications for DACA. In turn, the administration asked the Supreme Court to hear and rule on one of those decisions, from a judge in California, in an effort to bypass the process of an appeal going through the 9th U.S. Circuit Court of Appeals based in San Francisco. The case will now be heard on appeal by the 9th Circuit. But regardless of that setback for the Trump administration, “it does not change anything,” said Archbishop Jose Gomez of Los Angeles. “Congress has the responsibility to make immigration policy. It is long past time for members of Congress to take their responsibilities seriously — seriously enough that they are willing to act with courage to negotiate and seek compromises and resist the temptation to keep using this issue for their political advantage,” he said in a statement. Immigration advocates have long urged Congress to pass a “clean” bill to preserve DACA, without amendments providing for various immigration reforms. 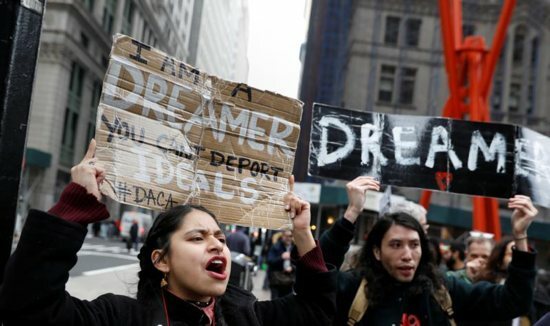 It’s called the DREAM Act — the Development, Relief and Education for Alien Minors Act — and it is what gives DACA recipients the “Dreamer” name. Archbishop Gomez was one of three officials of the U.S. Conference of Catholic Bishops who announced the call-in effort Feb. 19. As USCCB vice president, he joined with Cardinal Daniel DiNardo of Galveston-Houston, USCCB president; and Bishop Joe S. Vasquez of Austin, Texas, chairman of the USCCB Committee on Migration. “We ask once again that members of Congress show the leadership necessary to find a just and humane solution for these young people, who daily face mounting anxiety and uncertainty,” they said in their joint statement.